The joyous occasion today to award the Nobel Prize in Physiology or Medicine to UCSF’s Elizabeth Blackburn, PhD – among 10 women in history to receive that prize – marks the triumph of her extraordinary journey as a scientist. 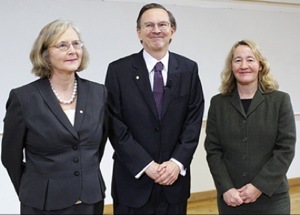 Also receiving the Nobel Prize in Physiology or Medicine today are co-recipients Carol Greider, PhD, of Johns Hopkins University, and Jack Szostak, PhD, from Harvard Medical School. The scientists were named to receive the prize “for the discovery of how chromosomes are protected by telomeres and the telomerase enzyme,” according to the Nobel committee. The scientists’ research sparked a whole field of inquiry into the possibility that telomerase could be reactivated to treat such age-related diseases as blindness, cardiovascular disease and neurodegenerative diseases, and deactivated to treat cancer, in which it generally is overactive. During the Nobel Prize Award Ceremony at the Stockholm Concert Hall, the laureates will be praised for their discovery, after which His Majesty the King of Sweden will hand each laureate a diploma and a medal. On Thursday, Dec. 10, beginning at 7:30 a.m. (PST), 4:30 p.m. in Stockholm, live streaming video of the Nobel ceremony will be viewable via the Nobel Prize website. It also will be made available as video on demand within 24 hours. UCSF Chancellor Susan Desmond-Hellmann, MD, MPH, is in Stockholm with Blackburn’s husband John Sedat, PhD, also a UCSF professor, their son Benjamin and other family and friends. This has been a memorable week for Blackburn, who participated in a press conference on Dec. 5 and delivered her Nobel Lecture on Dec. 7 at the Karolinksa Institute, which selects the winners of the Nobel Prize in Physiology or Medicine. For Blackburn, The Morris Herzstein Endowed Chair in Biology and Physiology in the Department of Biochemistry and Biophysics, winning the Nobel Prize represents a major feat in a 35-year career that has captured 55 prestigious awards. Blackburn’s top honors and awards include: receiving the Albert Lasker Basic Medical Research Award (2006); being named a foreign associate of the National Academy of Sciences; receiving the Benjamin Franklin Medal in Life Sciences (2005) and the Alfred P. Sloan Prize (2001); being named California Scientist of the Year (1999) and receiving the Passano Award (1999) and the Gairdner Award (1999). The date of the Nobel Prize Award Ceremony coincides with the death of the man who founded the program to celebrate life’s great work. Since 1901, the Nobel Prizes have been presented to the laureates at ceremonies on December 10, the anniversary of Alfred Nobel’s death. What started as a local tribute in Stockholm has evolved into an international series of events that culminate Thursday at the ceremony. The ceremony will be followed by the Nobel Banquet at the Stockholm City Hall for about 1,300 people, including the laureates and their family members. Blackburn has been selected to give a speech at the banquet. See the seating chart for the table of honor at the Nobel Banquet here. Blackburn, 60, was born in Hobart, Tasmania, Australia, and is a naturalized citizen of the United States. She received both her BSc undergraduate degree in biochemistry and her MSc degree in biochemistry from University of Melbourne, Australia. She received a PhD degree in molecular biology from University of Cambridge, England. After receiving a postdoctoral degree from Yale University, she did a postdoctoral fellowship at UCSF in 1978. Blackburn was a professor of molecular biology at UC Berkeley from 1978 to 1990. Blackburn joined the UCSF faculty in 1990 as a professor in the departments of biochemistry and biophysics and microbiology and immunology. In 1993, she was the first woman named to head the UCSF School of Medicine Department of Microbiology and Immunology, a position she held until 1999.